For anyone who's ever survived a rite of passage or performed a mating dance at Prom . . . The Japanese hold a Mogi ceremony for young women coming of age. Latina teenagers get quinceaneras. And Janice Wills of Melva, NC ... has to compete in the Miss Livermush pageant. Janice loves anthropology--the study of human cultures--and her observations help her identify useful rules in the chaotic world of high school. For instance: Dancing is an effective mating ritual--but only if you're good at it; Hot Theatre Guys will never speak to Unremarkable Smart Girls like Janice and her best friend, Margo; and a Beautiful Rich Girl will always win Melva's annual Miss Livermush pageant. But when a Hot Theatre Guy named Jimmy Denton takes an interest in Janice, all her scientific certainties explode. For the first time, she has to be part of the culture that she's always observed; and all the charts in the world can't prove how tough--and how sweet--real participation and a real romance can be. Funny, biting, and full of wisdom, this marks the debut of a writer to watch. 1. (+) Janice, the Protagonist - Descriptions from the book: overgrown praying mantis (aka very self-effacing), hypercritical, smart, funny, nerd-chic-hipster, president of the science club, founder of the Anthropology Enthusiasts Club, awkward, sincere, and ambitious. 2. (+) Humor - I thought the addition of the anthropological observations in addition to Janice's wry humor was a hit. Here's something I think shows both Janice's voice and the type of comments she makes on other people. "FACT: Stephen Shepherd had a scattering of long, curling whiskers sprouting randomly all over his chin and teeth that were always caked with orange crud from cheese puffs. He played Dungeons & Dragons neither ironically nor secretively, and had once (recently) worn a cape to school. This was the type of guy my mom figured I'd like, and this worried me." 3. (+) The Idea - I don't know about you guys, but I thought this also went hand in hand with the humor. A pageant celebrating the town's production of livermush? A girl who's making anthropological notes about her classmates? I mean, yes, there are the kids who observe and don't participate but I don't think I ever imagined a girl commenting on lip plates or Dian Fossey and her study of gorillas in conversation. 4. (+) The Setting - Very important part to the book. For one, you wouldn't have the pageant. Two, you feel Janice & some other characters's need to leave. And yet, three, they will still love their small town vibe. Finally, you wouldn't have some girls justifying their "slirting" without the town being so small. 5. (+) Character Development - Ah, Janice. In the time before the pageant, she learns a lot about herself. Some people accuse her of being mean when it comes to her comments and honestly? If I didn't get to see inside her head, I might have thought so too. So it's nice to see Janice realize things about herself & her anthropological skills. 6. (+) Pacing - I didn't put the book down. It reads pretty evenly throughout, never once too fast or too slow. In my opinion, it's fair to say that if you start off the book and like it, then you'll continue to like it, but if you think it's slow in the beginning, there is no 'bump' that you'll just get over; it'll be like that the rest of the novel. 7. 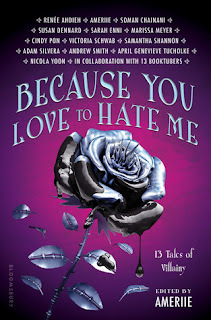 (+/-) Art - Because sadly my ARC copy does not have the art - just has pages marked for the art - though I'm sure it would've been a terrific addition to this novel. 8. (+) Romance - A true look at teenage romance filled with both awkwardness and cheesiness, jerks and nerds. But it came out well... except for the part where the artsy jerk apologizes. Not sure I'd believe that actually happening in real life... especially after what he did. 9. (--) Cliches - This book was often filled with satirical comments on society... but then they were also contradictory since Janice, scornful of such teenage habits, also undergoes so many cliches. Best Friend Betrayal? Social Stereotypes at School? etc. I mean yes, the second part is emphasized and taken a new level with Janice's anthropological analysis of her peers, and the first part is used for character development, but... there's nothing that new to them. They're still cliches and fall kind of flat for me, even when Janice acknowledges them in the book. 10. (--) The Cover - While this cover does represent the way Janice tends to hide behind her books and make observations rather than participate, it also doesn't really entice me as a reader. I think the publisher could have done something edgier, maybe even use one of Janice's anthropological observations to highlight the humor in the novel. 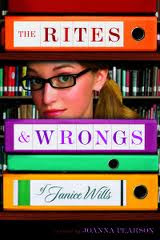 The Rites and Wrongs of Janice Wills is a contemporary fiction novel with the type of spice and humor that makes it stand out among the rest of them. If you read the summary and like it, you'll probably enjoy reading this book. Love the way you do your posts!! !